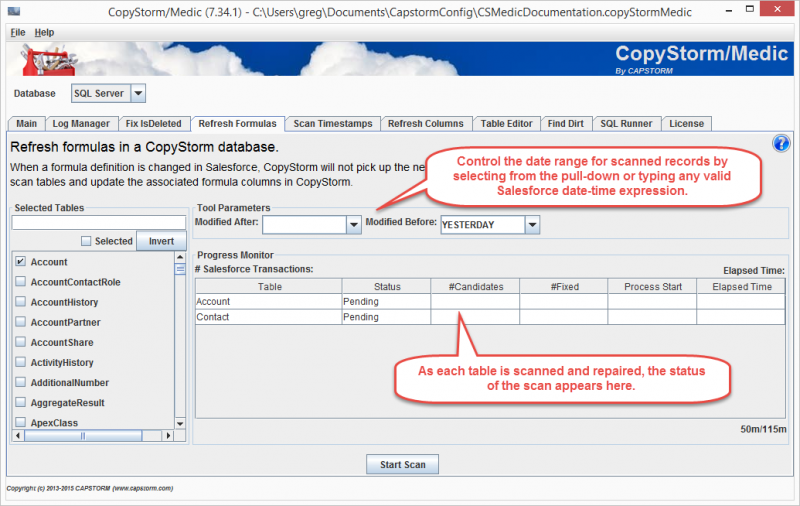 The CopyStorm/Medic Refresh Formulas tool replaces the values of formula columns in CopyStorm with their current value in Salesforce. This tool is typically used when the definition of a formula is modified in Salesforce. Performing a forced update on the CopyStorm database using CopyStorm. This technique works but will cause every column in the CopyStorm tables to be read from Salesforce and written to CopyStorm. Using this tool to limit reads and updates from Salesforce to formula columns. This technique can be many times faster than a forced update. The side of the dialog is used to select the tables to scan. Note that if a table without formulas is selected it will be silently ignored by the tool. The top part of the dialog is used to specify the date range of records to be updated. Leave these parameters blank to scan all records. The lower part of the dialog displays the progress of a scan as it happens.